Holding a solo fanmeeting is by no means an easy feat. Ong Seongwu proved that he could certainly fill up the stage for two hours with his charisma and wit. Showing off slick dance moves, serenading the crowd with his sweet vocals and showering fans with lots of fan-service, the former WANNA ONE member definitely held his own during his first solo fanmeeting in Singapore. With our sunny island as the last stop for his Asia Tour, it was evident Ong Seongwu gave it his all for his fans. 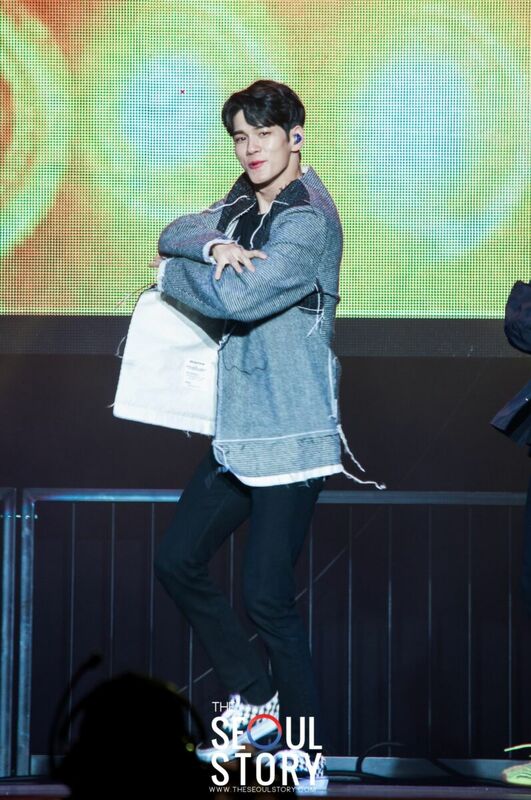 Opening the fanmeeting with a dance cover of a Bruno Mars track titled ‘Treasure’, Seongwu wowed the crowd with the accurate and precise moves which he is famous for. His fans loved every moment of it, cheering and singing along to every second of the song! Seongwu also covered Lee Sora’s ‘Please’ and Kim Jinho’s ‘Love This Moment’ later in the fanmeeting — two ballads which splendidly showed off his stable vocals. Fans were also able to know more about Seongwu through a Q&A segment titled OngTalk. What impressed us was his earnest and sincere answers to all the fans’ questions. Up next was the games segment which took up most of the two-hour fanmeeting. Seongwu was first tasked to catch five plushies from a claw machine as gifts for some lucky fans! He also had to guess the correct glass of caramel macchiato between five glasses of drinks given to him. Fans reveled in cheering Seongwu on for all his tasks! But perhaps the most fun and exciting part of the games and talk segment was when Seongwu was given a short paragraph of Singlish (T.N Singaporean English) to thank his Singaporean fans for all their support for him. Despite his first encounter with our local lingo, Seongwu’s determination to perfect the lilts and accents clearly delighted his fans no end as they loudly approved of his Singlish with happy and satisfied cheers. The unique segment surely earned a stamp of approval from the crowd! Towards the end of the show, a special fan-project was carried out for Seongwu by his fans to let him know that they will always be by his side supporting him. The VCR was presented uniquely and creatively in the form of a fan writing a fancafe post to Seongwu. One of the more memorable points of the video was when the fans from around the world created a montage of themselves in various attractions in their cities in a hand-holding pose, imitating a series of Seongwu’s personal photos. Seongwu was visibly touched by the fans’ efforts as he teared up towards the end of the VCR! As the fanmeeting drew to a close, Seongwu wrapped the evening up by bringing fans back to where it all started — a dance cover of Bruno Mars’ 2016 hit ‘That’s What I Like’. Seongwu first performed this song on the first episode of PRODUCE 101 Season 2 where he was ranked “A” and eventually debuted as a member of WANNA ONE! As the handwritten message “Your time, my time and our time become eternity” flashed on the screen to end the fanmeeting, it was certain that the time spent together for Seongwu and his fans would remain in their hearts for eternity. We would like to thank Hatchery for the lovely evening spent with Ong Seongwu and fans. [SINGAPORE] EXO Loves EXO-Ls Right with spectacular first concert of 2016!